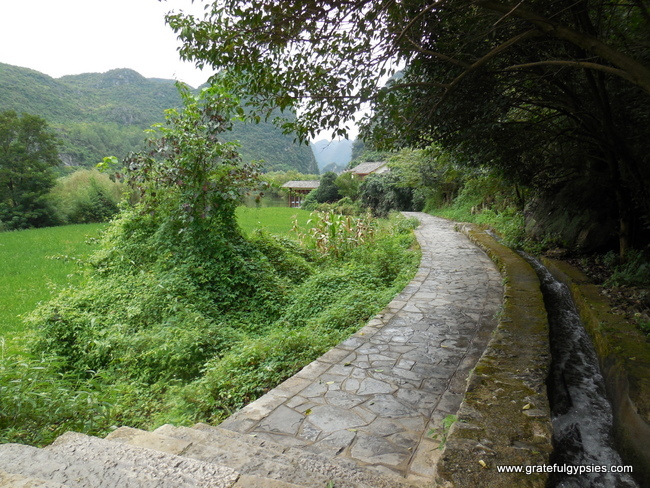 Nestled in Guizhou province is a small town called Anshun (安顺). The town itself is nothing special (except for the abundance of delicious lamb dishes) but the surrounding areas are absolutely beautiful and fun to explore. 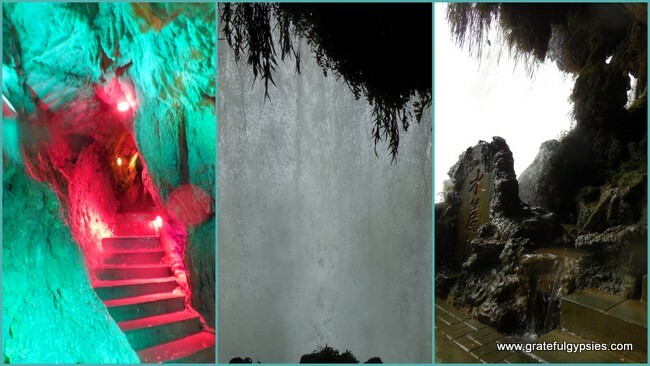 The two most famous sites are the Huangguoshu Waterfall and scenic area (黄果树瀑布) and the Dragon Palace Cave (龙宫洞). 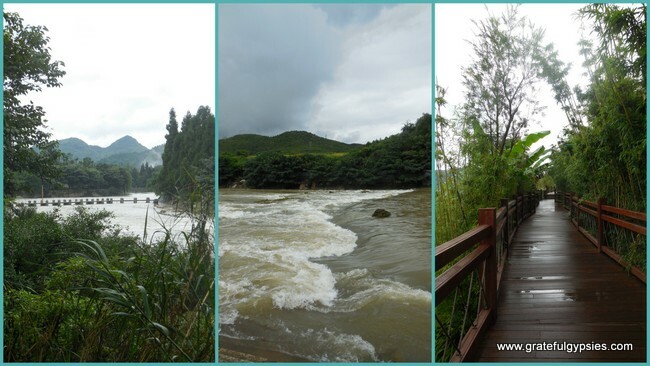 It’s a great overnight trip from Kunming so Rachel recently went there with some friends from work to check it out. Here are her tips for getting to, from and around the area. 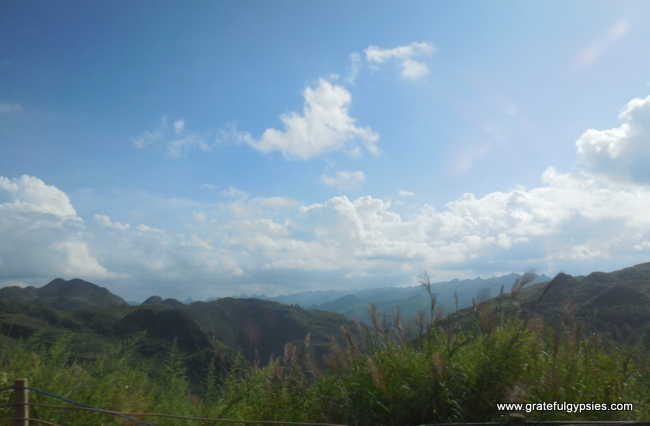 Anshun is easily accessible from Kunming by train. It’s a 7-hour ride and they have about sixteen trains a day between the two cities. Prices range from 75 RMB for a hard seat to 214 RMB for a soft sleeper. We decided to go for a hard sleeper for the way there since we were leaving at night (142 RMB for a lower bunk) and a hard seat for the ride home since we were coming back in the afternoon. 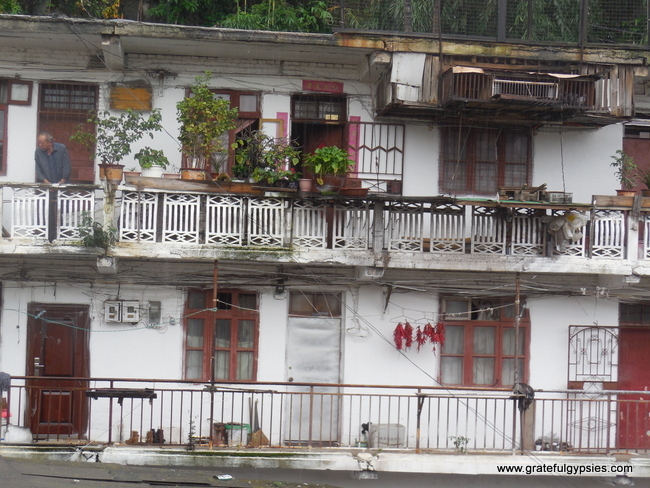 Upon arrival in the city we walked about 10 minutes away from the train station and found a small hotel called Hua Nan Bing Guan that had rooms with two double beds for 128RMB/night. The rooms were alright aside from the mosquitoes. We had our own bathroom and a small computer. There were also several business cards for ‘Massage Ladies’ that someone had obviously thrown under the door. The hotel turned out to be in a great location as it was just in front of the bus stop for bus #3 which is the bus that will take you to the East Bus station (东站). There are plenty of drivers waiting outside the train station ready and willing to provide their services. If you’re short on time it might be in your best interest to hire them to take you to the waterfall and cave because both places are a 30-minute drive from one another. But if you have some time it’s possible to do it all by public transport and save a bit of money. We had a day and a half so we opted to not hire a driver. The buses to both the cave and waterfall leave from the East Bus Station (东站). The local bus #3 will take you there from the town. It’s the last stop on the route so you can’t miss it. 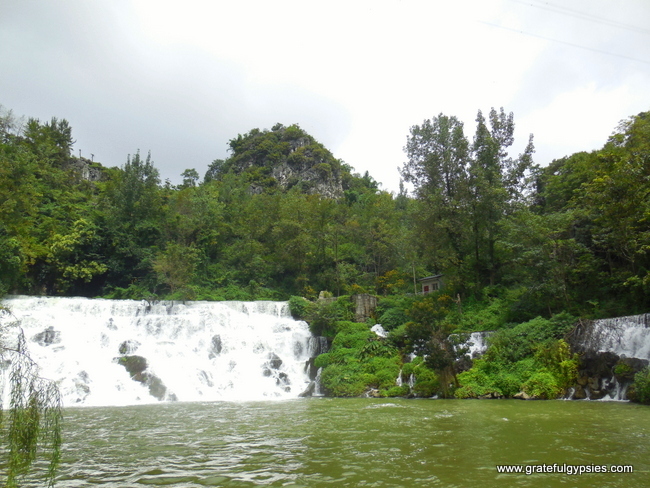 The cost for the waterfall bus is 22RMB and leaves every 20 minutes. It’s a direct bus so it takes about 30-40 minutes to get there from the station as it’s 45 kilometers away. The bus to the cave, however, is only 10RMB because it’s a local bus. It takes the back roads and picks people up along the way. So even though the cave is nearer the town than the waterfall it takes a full hour by bus from the station. The views along the way are spectacular, though. 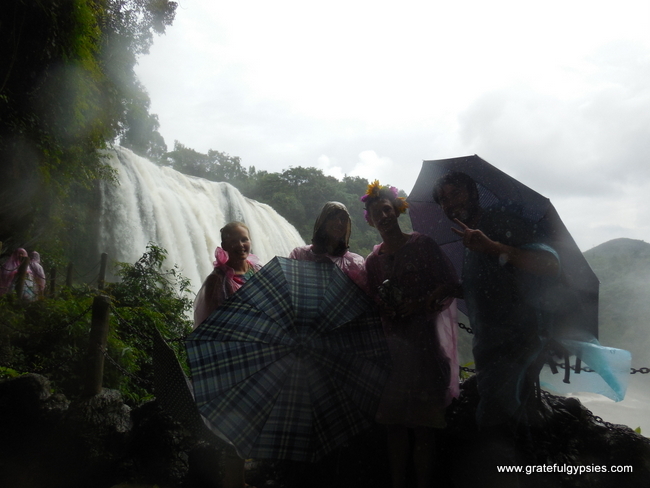 Upon arrival at the Scenic Area we were bombarded with several grannies who were selling ponchos. Whether or not you need a poncho depends on what time of year you visit. 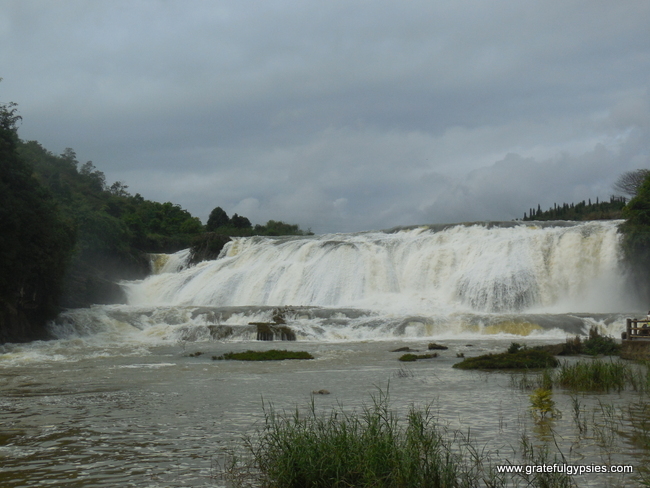 If you’re visiting from July – November the waterfall will be really strong because this is the end of the rainy season. The rest of the year it’s not so strong and a poncho is probably not necessary. You don’t need to purchase the ponchos from the ladies at the front, who are normally very pushy, as there are other ladies selling them inside the scenic area for only 5RMB just before you walk behind the waterfall. 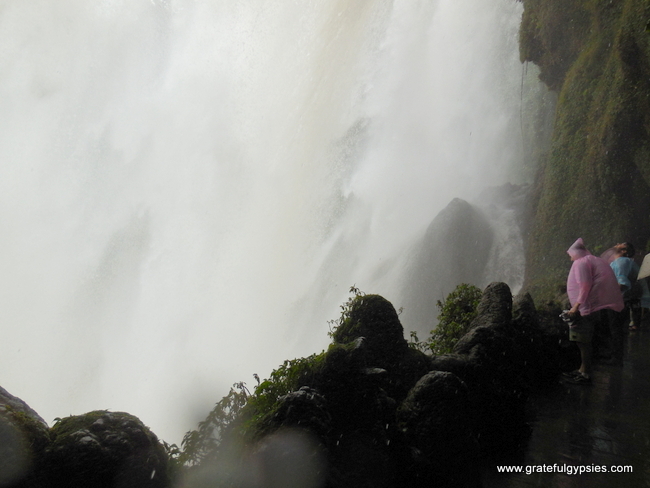 You can see how strong the waterfall is and decide for yourself. If you’re carrying expensive camera equipment or electronics it’s probably a good idea to buy one. 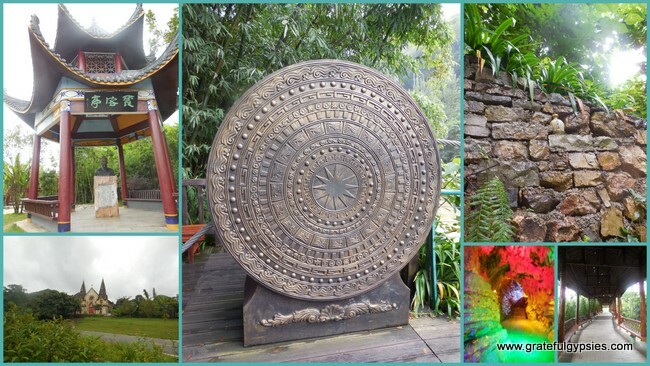 The entrance ticket is 180RMB per person and if you would like to take the sightseeing bus or a private taxi that is an extra 50RMB per person. It’s about 10-11km from the entrance to exit but we decided not to take either and just walk and it turned out to be a great idea because once you go in to the first waterfall area you can walk all the way through to the other side of the scenic area and you will likely have the place all to yourself as we did. The only reason to take the bus or taxi is to get you from the exit of the scenic area back to the front entrance where you take the bus back to Anshun. There were some nice local guys hanging out by the exit waiting for people like us who had walked through and offered us a ride back to the front for 30RMB total. For four people that’s a very fair price. We were unable to explore the cave because we didn’t have enough time. We didn’t know the local bus would take such a long time to get there. Upon arrival at the cave we were told we would need more than an hour to see the whole cave. They also told us that in order to take the local bus back to town we would just have to stand on the road and wait for it to come by and no one knew how frequently it came. With the entrance price at 150RMB/person we decided it wouldn’t be worth it to rush through. So we arranged with a driver who worked at the cave to take us back to town for 200RMB (50RMB/person), also a pretty fair price. In the meantime we explored the surrounding area which had stunning scenery. 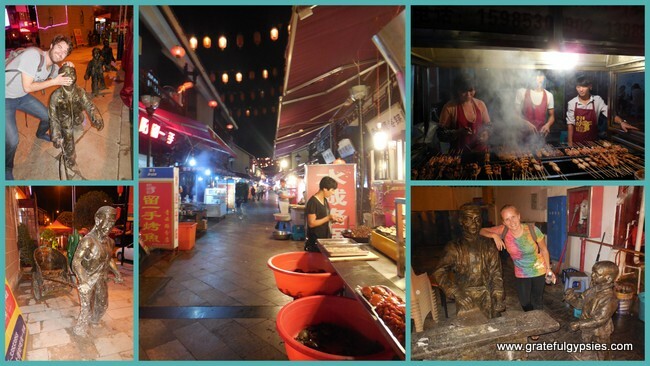 For our one evening in the town we headed to a night market street just a 6RMB cab ride away from our hotel. They had many different little restaurants and food stalls selling everything from BBQ meat and veggies to whole chickens and lamb legs. 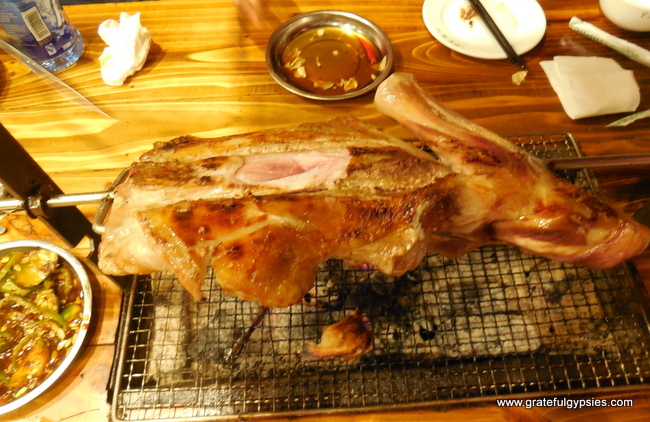 Since Anshun is famous for its lamb dishes we decided to roast our own leg of lamb and it was delicious. Tell any cab driver in town you want to go to the night market and they will know exactly where to take you. 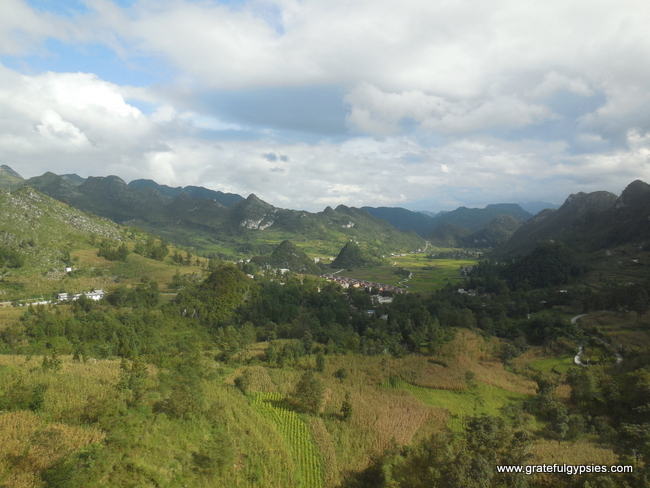 The scenery between Kunming and Anshun is absolutely beautiful so if you are traveling by train, taking a day train comes highly recommended. You will be treated to small villages and beautiful mountains in between entering and exiting all the tunnels that take you through those mountains. If you have any questions or are planning a trip to China please don’t hesitate to let us know in the comments! 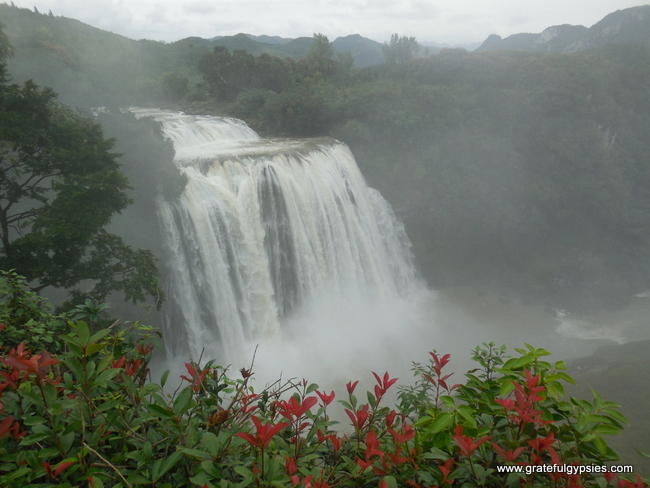 Have you ever been to Huangguoshu Waterfall or the Dragon Palace Cave? What was your experience like?